Epcot is 25. Where does the time go? I was lucky enough to have been born before Epcot opened, I hold that one over my sister’s head, though if pressed I would be forced to admit I don’t have any memory of Walt Disney World before Epcot Center. I was also lucky enough to spend this past weekend at Walt Disney World, I was able to spend some quality time with my father before I get married at the end of this month and I was able to show my admiration for Epcot on its Silver Anniversary. There are videos already popping up all over of the Rededication Ceremony, and for those of you who were unable to attend, yes, it was indeed something special to behold. Seeing Marty Sklar speak, the finale to Reflections of Earth (even in the rain), and watching the Communicore Fountain be restarted with waters from all over the world were all heart stopping. I am certain I am not the only one who caught a tear or two in their eyes during the day. I was able to record the audio of the ceremony, and I hope to have it here for you soon. So keep your eyes pealed. For those of you who don’t recognize him, that is Vice President Jim McPhee, the Big Cheese of Epcot. 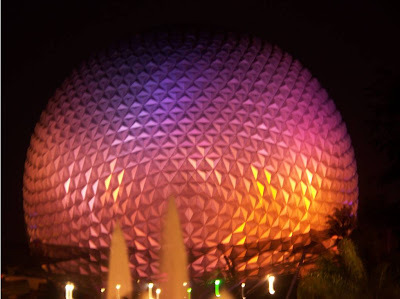 His team was responsible for putting together the sensational celebration of Epcot’s 25th. 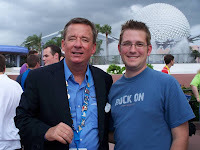 It was an honor to meet him, and I plan on sending him a copy of this photo along with a letter telling him that I think he has made a good portion of the million dreams come true just by removing the wand and giving Epcot its long-due Celebration. For those of you who noticed, that’s right, I have pictures, lots of pictures that I plan on using for this site. I also took a lot more notes to go with my memories for all of my future articles, including the Paths to Adventure series I am going to start this weekend. Oh, and yes, it does look absolutely gorgeous without the wand. I've met Lou once and Jeff on several times. They are both amazing, kind and friendly. I am looking forward to your new series...and lots more of your pictures.